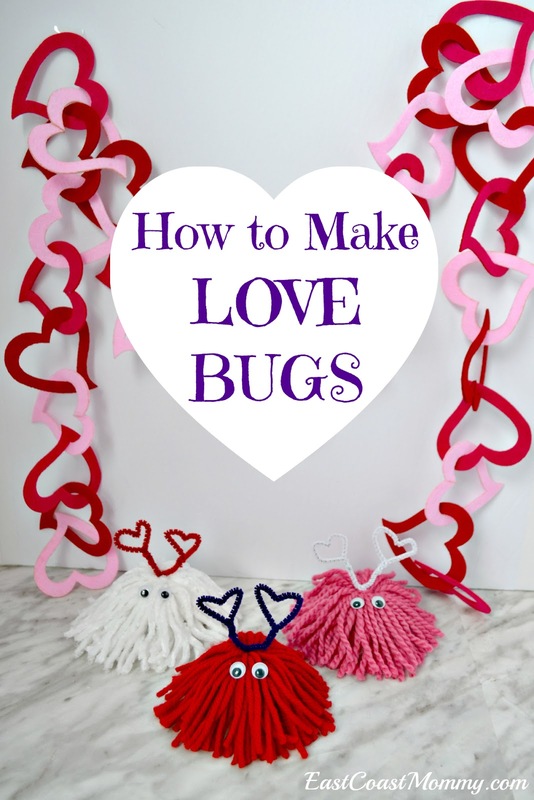 This graphic shows the step by step instructions for making love bugs... but keep reading for all the information you need to make these cute critters for someone you love. 1) Cut a piece of cardboard (3-4 inches high) from an old cereal box. 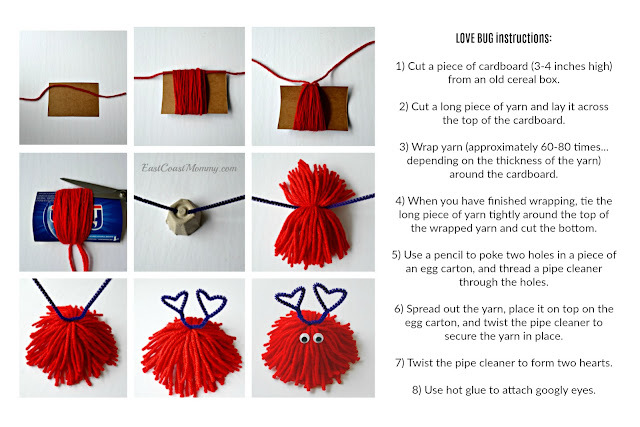 2) Cut a long piece of yarn and lay it across the top of the cardboard. 3) Wrap yarn (approximately 60-80 times... depending on the thickness of the yarn) around the cardboard. 4) When you have finished wrapping, tie the long piece of yarn tightly around the top of the wrapped yarn and cut the bottom. 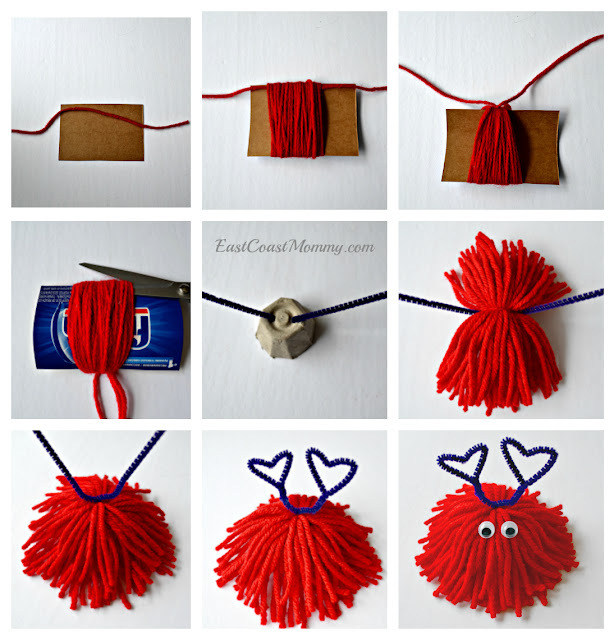 5) Use a pencil to poke two holes in a piece of an egg carton, and thread a pipe cleaner through the holes. 6) Spread out the yarn, place it on top on the egg carton, and twist the pipe cleaner to secure the yarn in place. 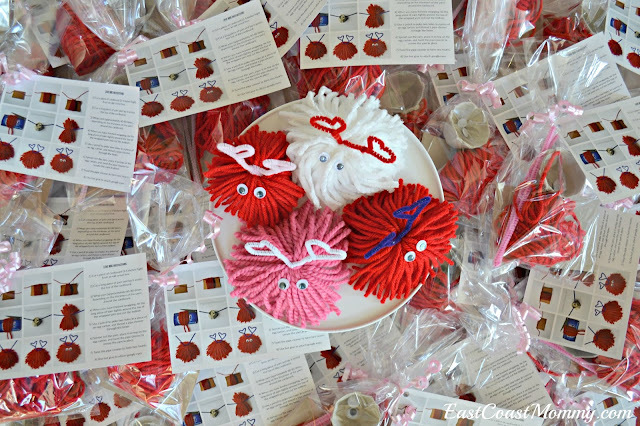 7) Twist the pipe cleaner to form two hearts. 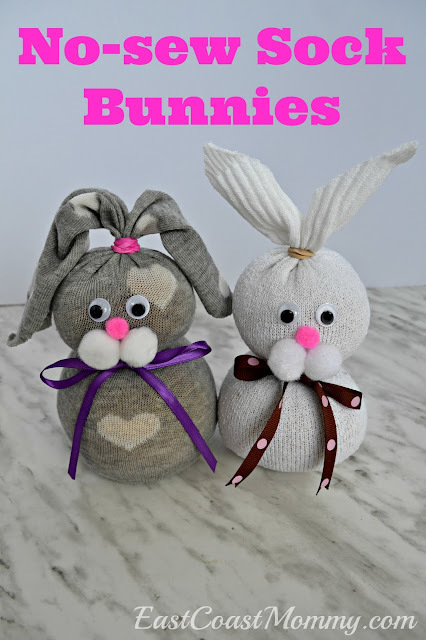 8) Use hot glue to attach googly eyes. You could also make up little "make your own LOVE BUG" kits. 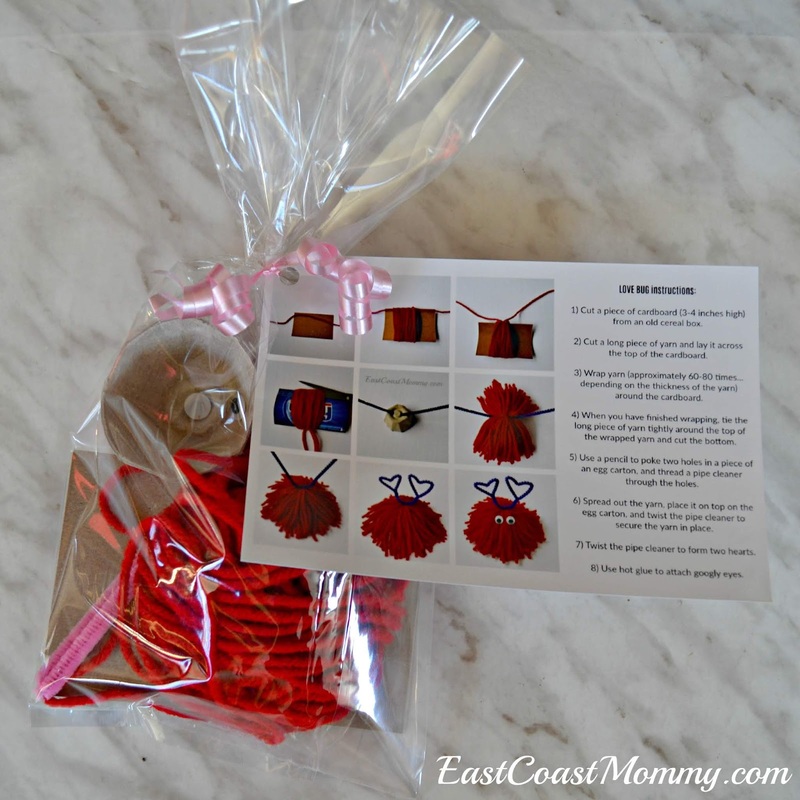 Just put all the supplies in a bag, and attach the instructions below. Wouldn't this make an adorable Valentine? To print the instructions: click on the photo below, save it to your computer, and print it like a regular 4x6 photo. I made a bunch of them in an evening for my son to share with his class. He's soooo excited to take them to school to share with his friends. Try playing with different colours and thicknesses of yarn. You can also add beads, pom poms, or cardboard hearts to the antennae. 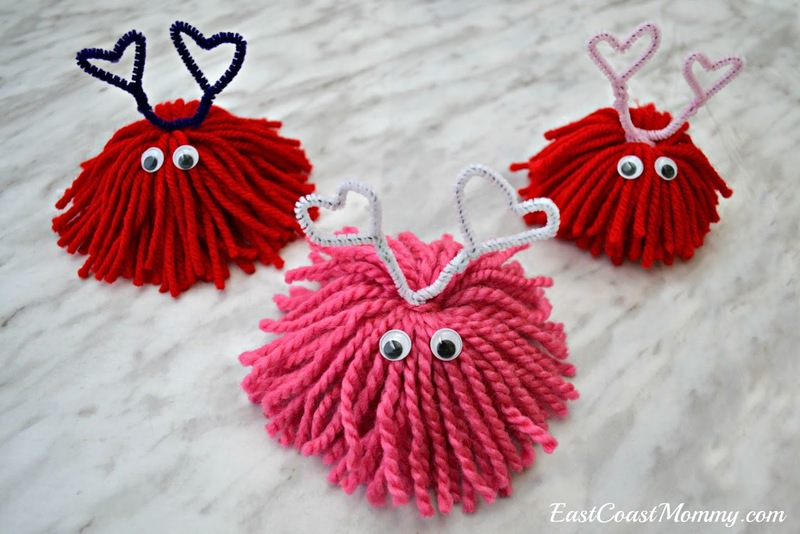 Use your imagination, and have fun making these adorable LOVE BUGS!